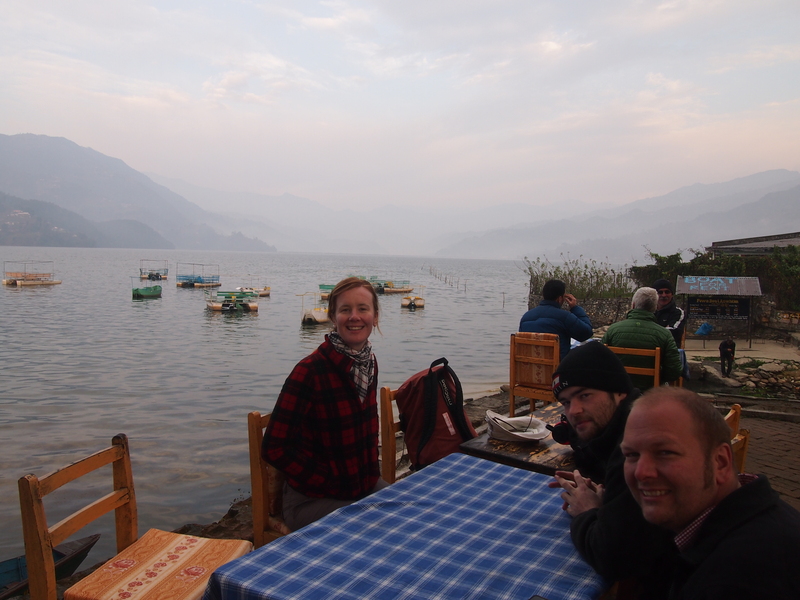 Amazing peaceful day in Pokhara walking along the lake beside little blue boats and daisies!!! The mountains appear to dip into clear blue waters as wooden paddles ripple it’s surface!!! The broken reflection of the glowing sunlight shining down from above…is….ahhhh heavenly!! The only interruptions to these moments of peaceful serenity is the sweet cracking voices of grandma’s calling out “Namaste” and jigging some hand crafted necklaces when you turn your head to respond!!! But it sought of brings an extra charm to the place as they ponder along the lake path with their shawls and little backpacks!!! This, next to the triumphant shouts of the local soccer team “MMC” partying on the top of a moving bus after winning a international soccer competition, gives a little chilli and spice to this relatively quiet city!! After a early morning wake-up with Andy thinking it was 9:55 but in reality was 8:55, we slowly wandered down past the touristy shops towards the foreshore!!!! Glimpsing white deck chairs and sunshine lit gardens, how could we say no to a lakeside restaurant called “Boomerang” to remind us a little bit of home!!! With grumbling tummies there was little left of our trekker’s breakfast, omelettes and Marsala tea. Afterwards we decided to organise our walking trip into the mountainside wilderness and rested in the gentle breeze blowing across the lake waters!!! Tomorrow the adventure continues south-west of Pokhara to Panchase a little country village with spectacular views of the Annapurna range and it’s snow capped mountains!!! As the sun sets over the World Peace Pagoda and splashes of gold slice across the milky clouds, you could say we were falling in love with Nepal, a rugged mountainous country of colour and pure wilderness!! This entry was posted in Nepal by Victoria. Bookmark the permalink. did you know nana and opa went to lakes entrence on sunday and got back yesterday. was para gliding fun, scary or what? Paragliding was a lot of fun, not scary at all. You want to come next time we go? There was another option we could have done called “parrahawking” – basically the same as paragliding, except you have a big steak in your hand and a hawk comes and grabs the food from you – in the air – that sounds scary! Home next week, looking forward to seeing everyone. Hi Guys, we have returned from a fantastic time in Tassi. The ford is limping along and all the animals were well looked after. Great to read your blog but can’t access the photos. It is great to hear you are having a fantastic time. Great to hear you are home and enjoyed your time away. Thanks for looking after our place and all of the uni arrangements. Looking forward to seeing you guys next week when we’re home. Happy trails! Just caught up on all your adventures. Great photos. It sounds like you are having a great time, and I am very jealous. I’m looking forward to hearing all about it in more detail when you get back.